WHY JOIN SMDRA AS AN AFFILIATE PARTNER? 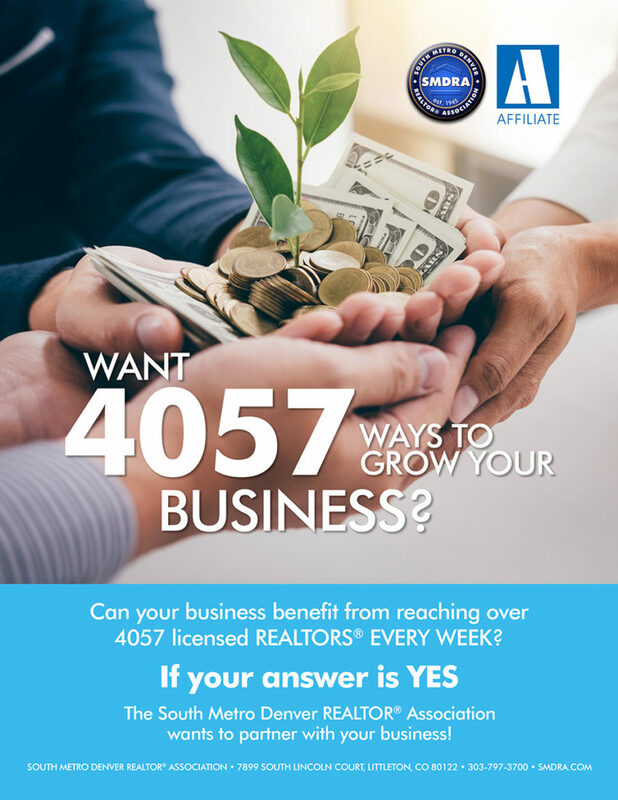 Being a member of SMDRA means having access to over 4000 REALTORS® and over 350 real estate related businesses in your area. REALTORS® work with professionals they know, like, and trust – join and become their go-to for real estate industry related services. TOP REASONS TO JOIN SMDRA! SMDRA AFFILIATE DATABASE – Put your brand on our Find An Affiliate Vendor searchable website so SMDRA Members can find you! EDUCATION CLASS SPONSORS – Get one-on-one networking opportunities by becoming an Education Sponsor. You provide the refreshments, SMDRA supplies the MEMBERS! ROSTER OF MEMBERS – Affiliate Members can request a full member roster, and a roster of mailing labels for all members ($75 fee and 24 hour notice required for mailing labels. Must be an active Affiliate member in good standing to request). METRO MARKET PULSE MARKETING MEETINGS – Attend our Friday Morning Metro Market Pulse meetings to network with SMDRA REALTORS® and other Affiliate Business Partners to grow your business. Featured time for networking, introductions, and ‘Shout-Outs’ to referrals, with opportunity to sponsor the meeting. SMDRA FACEBOOK GROUP – Join SMDRA’S exclusive online community through the SMDRA Facebook Group. This is a closed group, with SMDRA Members only, where you can exchange referrals and find services. WEEKLY EBLAST NEWSLETTER – Opportunity to advertise in the SMDRA Weekly eBlast sent to close to 6500 emails. NEW MEMBER GOODIE BAGS – Get the opportunity to share your brand with new REALTORS® through the monthly New REALTOR® Orientation Goodie Bags! All affiliates are invited to drop off promotional items such as flyers, pamphlets, novelty items, gift certificates for services, etc. to be put into Goodie Bags given at that month’s New REALTOR® Member Orientation. INDUSTRY INSIGHT EDUCATION SPONSOR – Got real estate knowledge you want to share? Become an Industry Insight Education partner and teach a class on your subject right here at SMDRA. CORPORATE SPONSORSHIPS – Become a SMDRA Annual Corporate sponsor to receive additional marketing exposure and benefits. HEALTHCARE PLAN – Access to the SMDRA Member Healthcare Plan. COMMITTEES – Join one of SMDRA’s many committees to become further involved with other Members. EVENTS – SMDRA hosts quite a few events that give Members even more opportunities to market, network and promote their business and its services. WE ARE FUN! – Guess you will have to join to find out!